Kretek cigarettes, first made is for medication purpose. The original mixer of Kretek, Haji Djamhari. He suffer from Astma and chest pain. In java, we use clove oils used to rubbing oil or inhalation to reduce astma, or heavy breathing for centuries. So, the ideas come from it. Haji Djamhari start mix tobacco and clove to help him heal his astma and chest pain. Then, it works. Nowadays, Kreteks blends spices added to gain more pleasure and flavor. 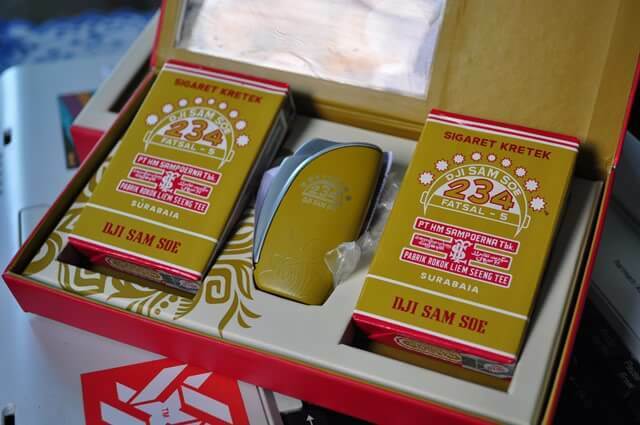 The golden era of kretek, is 18th centuries. Where many kreteks manufacturers are grow to spread kreteks smoking culture. Actually, nobody knows when the excact time, Indonesian people start smoking tobacco. When Dutch and VoC invade Indonesia in the middle of 16th centuries, smoking culture already recorded far before. Cloves, and Tobacco. Are the most valuable commodity at that era. Those why make western and european invade Indonesia. Dutch, British, Portugese, invading our rich country to grow plantation. Works Indonesian farmers to plant those valuable commodity, takes over their lands, and the farmers never get paid. 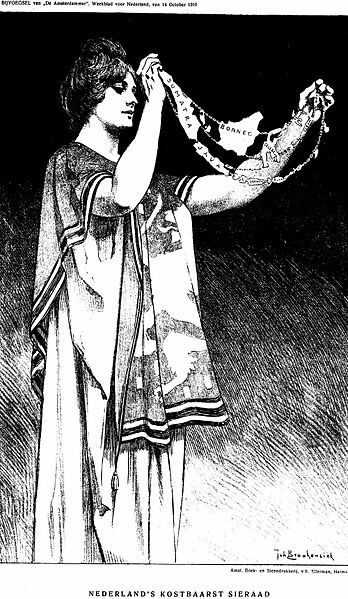 Close up of artwork representing the Netherlands Empire holding its crown jewel: the colonial Dutch East Indies (Now: Indonesia). Text: “Nederland’s kostbaarst sieraad”, “Netherlands most precious jewel”. Dutch imperial art by Joh.Braakensiek, printed by Ellerman Harms and published dd. 1916-10-14 in newspaper ‘De (Groene) Amsterdammer’, the Netherlands. Indonesia is one most richest country in the world. We almost can grow anything. The best tobacco, cloves, spices, and coffee are come from our lands. Dutch VoC occupy Indonesia for mostly 350 years. Sacrifice million of lives for their demands of commodity. The dark era had been ended. We are now independence country. And being the most strongest country in the world. Without showing we are the “police of the world”. Humble, honest, and smile are our way of live. Indonesian economic growth reach 5.1% each year. And grow steady. With more than 250 Million population, Indonesia will be the strong and valuable country in the next years. There will be allways dark side from a country. We let other countries see us like 3rd world country. But, we are awarded with the most happiest people in the world. Peacefull of living, cheap everything, low tax, free education, social protection, freedom, none will harash you from your skin color, everyone free to do their believe and religion. We will always like that. From now to the next thousands of years. Notes about when exactly the Indonesian population started smoking no one knows for sure. According to Thomas Stamford Raffles and De Condolle smoking kreteks existing in Java around 1600. In a book titled Cigarettes, Trails of History and Meaning for Development of the Nation (1987) Amen Budiman and Onghokham King wrote that Sultan Agung Mataram in 1613-1645 was a heavy smoker. Haji Djamhari is a legendary figure who lived in the Kudus City in the 19th century, and is believed to be the inventor or first Kretek Maker. Narrated, initially Djamhari suffering chest diseases, or suspected asthma. He did therapy on himself by rubbing clove oil on the chest and back. As a result, suffered the pain is reduced. Furthermore, Djamhari improve treatment with chewing cloves. But the result is better. In the end, he cloves finely chopped, then poured it on tobacco that he used to smoke. Magically, the disease is cured. People he knew began to follow in his footsteps, cloves sprinkled on tobacco for smoking. Besides efficacious cure, there is a distinct flavor of clove tobacco blended with cloves. From where kretek clove, which became known as kretek, became known and widespread. Haji Djamari of this invention, emerging home-based industries that produce kretek. 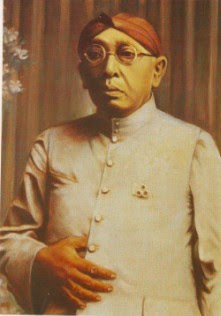 Haji Djamhari died in 1890. Historians estimate Onghokham clove discovery events occurred between 1870 to 1880. Starting from treatment efforts eventually evolved into merchandise that spawned cottage industries. Kretek Haji Djamhari findings proved very popular with the public, so it continues to grow. Kudus manufacture of cigarettes spread to other cities include Semarang, Surakarta even crossed into East Java. Manufacturer was not only among the natives, but also of Chinese descent. Haji Djamhari probably never imagined that eventually kretek clove pioneering now refined and expanded so transformed into a kretek industry.